Just wanted to summarize an interesting article in the Atlantic Monthly regarding our current financial crisis. This article was written by Simon Johnson, PhD of economics from MIT, former chief economist of the International Monetary Fund, and expert on economic crisis prevention and mitigation, specifically with emerging market countries. He begins the article by describing his typical clientele, officials from emerging market countries of eastern Europe, Asia, and Latin America. Typically, these countries are in dire economic conditions for the same reason - the powerful elites within them overreached in good times and took too many risks, building massive business empires on a mountain of debt. When credit conditions become tighter, a nasty downward econmic spiral ensues with the government giving assistance to their old friends, the well-connected, oligarchs who had previously brought much wealth to the country. However, as conditions get worse the government's need to squeeze someone falls first on the ordinary working folk, only until riots grow too large. It is not long after this that the country's minister of finance will be at the IMF in need of a loan. This is the typical scenario encountered by the IMF and the economic solution is relatively simple, it's the politics that becomes the obstacle. The IMF's job then involves sorting through the politics of the emerging market country, making sure that those well-connected oligarchs that are incompetent are released from power. Some of the elite must take a hit. History has shown these situations to be strikingly similar and, fortunately, the outcome is also similar: the IMF program leads to economic stabilization and eventual growth for the emerging market country. The similarities of these economic crises in emerging markets are disturbingly similar to what is happening in the United States: credit tightening, global investors no longer lending, close ties between the financial business and the government, financial businesses making riskier and riskier gambles with the knowledge the government (their "friends") would help out if a gamble did not succeed, and the financial companies wielding their power to prevent the sort of banking reforms that are necessary to resolve the problem. The things that led to this crisis have been developing for the past 25 years: presidential administrations have been deregulating the industry (including regulations that were passed as a result of the Great Depression), riskier investments have been allowed, the connections between Wall Street and Washington have been strengthened, and the SEC becoming more and more invisible in its enforcement. These developments have led to unprecedented power within the finance sector. The finance sector, which historically accounts for less than 15% of U.S. Business profits reached 41% this decade. The average pay per worker in the financial sector, which historically averages around 100% as it should, reached 181% in 2007. As for some examples of the NY/DC connections: Robert Rubin was co-chair of Goldman Sachs, Treasury secretary under Clinton, and later chairman of Citigroup's executive committee. 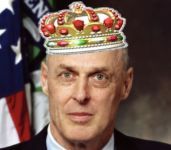 Hank Paulson, CEO of Goldman Sachs later became Treasury Secretary under George Bush, and of course instituted the $700 billion bailout and saved AIG from bankruptcy with $85 billion. The possibility of a conflict of interest seems almost assured. Paulson maintains close friendships with higher-ups of the bailout beneficiaries, personally received $200 million in tax-deferred benefits from Goldman Sachs, is proposing to use the $700 billion bailout fund in ways originally not intended, and has unprecedented power over the economic and financial life of the United States as the Paulson Plan states "Decisions by the Secretary pursuant to the authority of this Act are non-reviewable and committed to agency discretion, and may not be reviewed by any court of law or any administrative agency." The ties between the financial elite and the government is redolent of corruption similar to the emerging market economies commonly reviewed by the IMF. The challenges the United States faces are familiar territory to the people at the IMF. If you hid the name of the country and just showed them the data, there is no doubt what old IMF hands would say: nationalize troubled banks and break them up as necessary. This solution is a proven solution for emerging market economies. The root cause of the banking problems is hiding of losses. These banks do not want to reveal the magnitude of their losses as it would render them insolvent. Instead, they ask for handouts that aren't enough to make them healthy but are just enough to keep them upright a little longer. The banks then tend to make even riskier gambles in the hopes of striking it big, exacerbating the problem further. Thus, the government must force the banks to acknowledge the scale of their problems, and essentially the only way to do this is to nationalize the bank, of which the US government itself has insisted to multiple emerging-market economies in the past. The goal isn't to have permanent state ownership of the bank, but instead have immediate recognition of the financial problems, replace failed management, clean up the balance sheets, and then sell the banks back to the private sector. As mentioned before, the economic solution is usually the easy solution; the political solution is more difficult. Thus, the second problem the U.S. faces is the power of the oligarchy. This solution is not simply about changing the oligarchy but breaking up the big banks in order to limit power. In September, Lehman Brothers was allowed to go into bankruptcy (the largest bankruptcy in U.S. history) but Citigroup and Bank of America are much bigger compared to Lehman and have been called "too big to fail". Anything that is too big to fail is too big to exist. Any one company that can bring down the entire economy should be broken up into smaller pieces. Up until now we've compared the U.S. financial crisis to those of emerging-market economies. But the U.S. is not an emerging market economy. When emerging market countries run out of money, they literally run out of money, as they are dependent on foreign currency and these foreign countries have stopped lending. Rich beyond measure and with the ability to pay other countries in its own currency, the U.S. simply has to print more money, a consequence which would allow the economy to stumble upon for years with high inflation without ever resolving the root cause problem, and therefore never fully recovering. This scenario is not an option for emerging-market economies. Another scenario has a bleaker outcome. As the global economy worsens and our government is unable to muster the courage to take action against the banking system and breaking of the old elite, the inter-connectedness of the global economy pushes the U.S. economy further into a nosedive, which in turn causes the global economy to worsen, resulting in a vicious cycle and ultimately into another Great Depression, whose magnitude could be equal to or greater in extent due to the inter-connectedness of today's world economies. Good summary son, you hit most of the main points. His final statement that it could be worse than The Great Depression is certainly not confidence building. And describing Treasury's actions as impossible is dishearting! Thanks Dad. I just hope Hank's dealings with the big banks was more like what the IMF did with the emerging-market economies, rather than appeasing to the financial institutions. In a way it sounded as if this were the case. I like to think optimistically. But the reality is the same guys are still running the same giant, too-big-to-fail companies, and I don't trust them nor their earnings reports.